The taste you get from homemade bread is so much better than what you buy prepackaged in any grocery store that it makes you wonder why you don’t make your own bread all of the time. For me, I then remember how much time it can make to prepare and make the dough along with the kneading and everything else and I realize I don’t always have enough time to make my own bread even though we love having it. Recently though I came across this recipe at New York Times Cooking from Mark Bittman and it may me realize just how easy some bread recipes can be. This is for a baguette that is a combination of rye or whole wheat flour and all-purpose flour that you can put together quite easily. I was able to start it in the morning, let it rise for a few hours while I worked and then finish it off right before dinner so that it came out perfectly. It is only 4 ingredients, which makes things even better, and all of the kneading can be done in the food processor to save you some time and effort. Combine the rye or whole-wheat flour and the all-purpose flour, along with the kosher salt and the yeast, in the bowl of a food processor. With the machine running add water until a ball forms, about 30 seconds. Start with 1 1/2 cups of water. You may need a little bit more or a little bit less. After the water has been added completely, process the dough for an additional 30 to 45 seconds. Place the dough in a large bowl and cover it with plastic wrap and allow it to sit until it has risen, about 2 to 3 hours. Place the dough on a lightly floured surface and cut the dough into 3 pieces. Form each piece into a rough log, or, as an option, leave the dough as one piece so you can make one large boule, ciabatta-shaped loaf or other shape that you like. Cover the shaped dough with a towel and allow it to rest for about 20 minutes. Shape the logs into long baguettes and, if you wish, support the shape by placing them into baguette pans or a lightly floured piece of canvas (I actually just left mine alone and they seemed fine to me). Preheat the oven to 465 degrees and if you have a pizza or baking stone, leave it in the oven to heat. After shaping the loaves, they will be ready to bake in about 30 minutes. 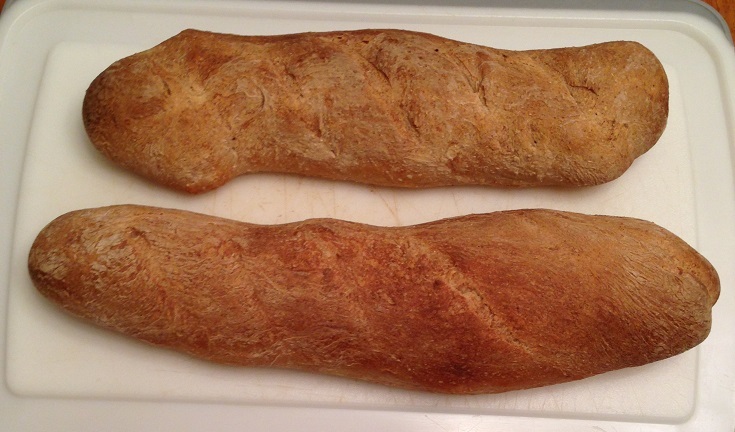 Slide the loaves onto a pizza peel or into the baguette pans. Slash or cut the top of the loaf with a sharp knife. Bake the loaves, lowering the heat if necessary to prevent the loaves from over-browning, until the loaves reach a temperature of 210 degrees on an instant-read thermometer inserted into the loaf, about 20 to 30 minutes. Cool the loaves on a wire rack before using. It is a very simple recipe that you can use to have bread any day or time that you like. The loaves turned out great and I decided to shape the dough into just 2 loaves for us. We used one for dinner that night and saved the other for other uses such as sandwiches and with another dinner and it was fantastic. It had a nice crunchy crust and the dough had just the right type of chew to it and the combination of the 2 flours gave it some great flavor. I am making some more today to go with a chicken stew I am making and it should be great..You could always take one and wrap it up and freeze it so you have it on hand when you want a fresh loaf of bread.